A condition in which abnormal proteins (called amyloids) become deposited in the spaces between cells. In some cases, the cause of amyloidosis is a systemic disorder in which the body over-produces proteins–for example, multiple myeloma, a blood disease; in these cases, the amyloid deposits can be dispersed widely across the body. In other cases, the amyloid deposits do not seem to reflect systemic disease, and in such cases, the amyloid deposits can be more organ-specific. 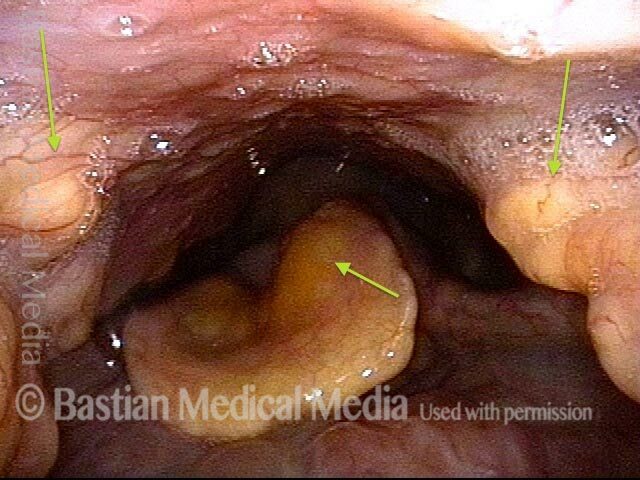 In laryngeal amyloidosis, the deposits seem to be localized either just to the larynx, or to the larynx and pharynx. One sees what looks like yellowish candle wax within the tissues. The amyloid deposits are quite firm, and when biopsied, there is little bleeding. Because of their infiltrative nature, amyloid deposits typically cannot all be dissected out of the larynx; instead, then, an operating physician will aim to debulk the deposits in areas where they impair breathing or the voice. That is, when deposits are widespread in the larynx, there does not seem to be any point in removing them except in locations where removal will improve function. Often, repeated procedures are required over many years’ time, though occasionally the condition seems to stop progressing. Panoramic view. Submucosal amyloid deposits in pharyngeal walls and epiglottis, with examples at arrows. View of anterior subglottis shows diffuse infiltration of yellowish, submucosal amyloid. Phonation under strobe light shows deposit at anterior commissure tethering upper surface of left vocal cord, and resultant vibratory asymmetry. Some months later, after laser debulking at short arrow, showing improvement of vibratory closure after tethering reduced. Note increase of nearby supraglottic amyloid deposit does not need to be addressed because it has no functional consequence to the patient, who has other asymptomatic deposits in subglottis, epiglottis, and nasopharynx. Amyloid deposits (arrows) at the carina, where trachea splits into right and left mainstem bronchi, as well as a few centimeters down the left mainstem bronchus (smaller arrow). The deposits appear yellowish and widen or project from the tissues they infiltrate. Many months after debulking, and with complete healing, the voice can pass for normal, and the laryngeal vestibule is no longer filled with the enormous bulk of amyloid. The nubbin at anterior false cord would only need removal if it became large enough to interfere with voice. Panoramic view of a large spherical mass of amyloid material bulging submucosally (contour at dotted line) in the false and aryepiglottic cords. The patient has only a harsh stage whisper, and glottic voice only with inspiratory (inhaling) phonation. The posterior vocal cord and ventricle of the opposite side (left of photo) are visible, but the amyloid mass obscures all but a few millimeters of the posterior cord on its side. 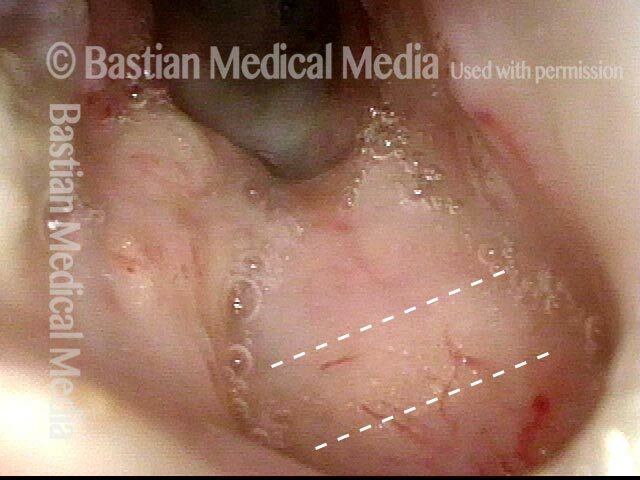 View yet further down, showing the upper trachea (top-center of photo), the posterior end of one of the vocal cords (left of photo), and the edge of the amyloid mass (bottom-right of photo, again marked by a dotted line). The mass is again obscuring a view of the vocal cord on its side; in fact, it is pressing the cord downward, which affects the voice. Phonation, while attempting to see the vocal cords beyond the large overhanging mass. 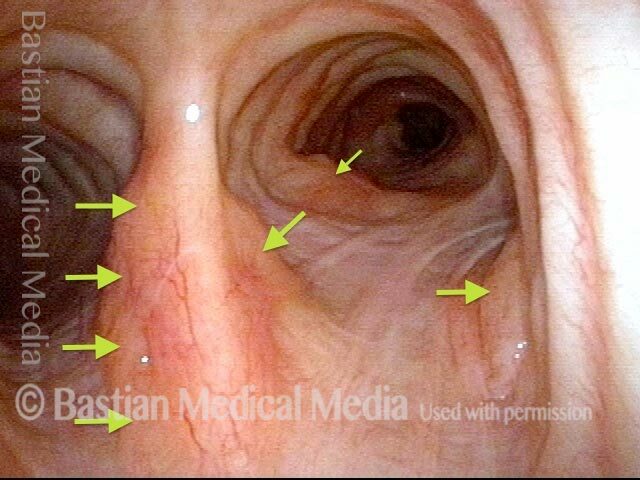 The vocal cords are each marked with an F, one of the posterior ventricles with a V, and the amyloid mass with an A. This mass actually overlies most of both vocal cords and presses them both downward. Twenty-four hours after laser removal, i.e., debulking. Looking into the deepest recess of the dissection. The parallel lines indicate the upper border of the thyroid cartilage. 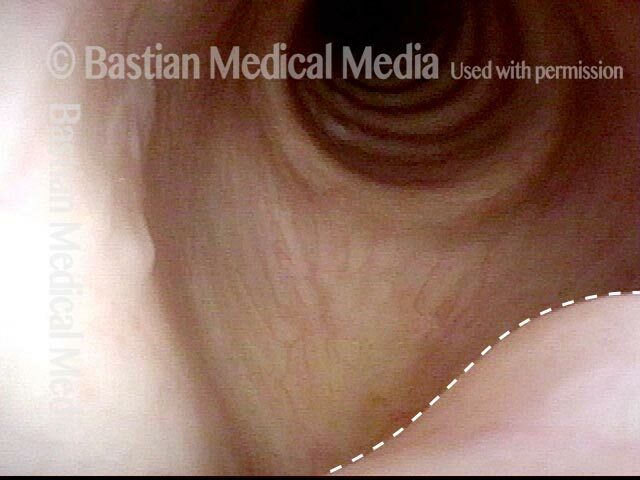 After debulking, both vocal cords are now visible from this angle (compare with photo 2). Remaining swollen overhanging tissue did not appear to be infiltrated with amyloid deposition. This video gives an example of amyloidosis, which is a condition in which abnormal proteins (called amyloids) become deposited in the spaces between cells. This entry was posted in Multimedia Encyclopedia and tagged Disorders, Photos, Tumors, Videos, Voice & other larynx disorders by admin. Bookmark the permalink.